A classic, complex Gigi original that is more than just a song! There are two separate solo sections in different keys, as well as a metrically tricky out head. Three different recordings are featured, with solos from all, plus Minus You audio from jazzleadsheets.com's own version. Learn the melody first is always our motto. The melody is the same in all three featured recordings, so the lead sheets shown are identical. There's one lead sheet edition for each instrument (B-flat, E-flat, C treble clef, C bass clef), and it can be played along with any of the three recordings. It's also the melody, and the format, for the minus you recording tracks (see the Gigi Gryce Project album cover). If you click on and purchase one B-flat lead sheet, for example, the B-flat boxes will be checked for all recordings, but you'll only buy one. There are slight differences in the harmony horn part from recording to recording. Rather than create slightly different second part editions, which we feel would only be confusing, we're making Concert Condensed Scores available so you can examine each recording carefully to see what was harmonized in each one. The first recording of this Gryce composition begins with a stop-time intro in which the key center is not immediately discernable, but the head is straightforward as it is a swinging 16-measure hard-bop line in the key of D♭. However, the second time through ends in a two-measure interlude modulating down to C for the horn solos. These solos are on an entirely different, 56-measure AABA form, with the A sections beginning the same as the standard Cherokee but changing in the eleventh measure. The eight-measure bridge is entirely in chromatically ascending and descending major chords. The intro then reappears as an interlude, leading to a piano solo on the changes of the in head. There's a four-measure drum break which goes into a sort of shout chorus that serves as the out head clip. This new section (letter F in the lead sheet) begins in 3/4, but with the bass and drums still implying 4/4. In the arrangement on this recording, the 3/4 continues for nine measures, returning to 4/4 for a three-measure phrase that connects again with the seventh measure of the in head; this is where the in head returns and continues to the end of the form. On this recording, however, it's not clearly executed. The arrangement on the later recording (click on the second album above) is slightly different here. Art Farmer and Gigi Gryce solo transcriptions are available; click on the Solos tab for more details. This session was the only studio album in which Gigi Gryce and pianist Duke Jordan played together; Duke was also on Gigi's live album "Doin' The Gigi," recorded two years later. Both Art and Addison Farmer also recorded alongside Duke Jordan on Gene Ammons' 1957 album "The Happy Blues." Duke reunited with Art, drummer Philly Joe and bassist David Friesen in 1978 to record two albums, "Duke's Artistry" and "The Great Session." The only other recording of Gigi and Philly Joe together is the classic Tadd Dameron nonet session of June 11, 1953, also featuring trumpeters Clifford Brown and Idrees Sulieman. For more from this session check out Evening In Casablanca. Wikipedia notes that, "On 29 July 1955, U.S. President Dwight D. Eisenhower announced through his press secretary that the United States would launch an artificial satellite during the International Geophysical Year (IGY). A week later, on 8 August, the Politburo of the Communist Party of the Soviet Union approved the proposal to create an artificial satellite. . . . It was during this period of scientific cooperation that the Soviet Union stunned the world with the launch of Sputnik, the first satellite ever. On October 4, 1957, the USSR put into orbit a tiny sphere with a radio transmitter that beeped its way into history." Art Farmer [clip] takes the first chorus of the Cherokee-based solo section; Gigi [clip] follows with another chorus. These solos are a classic opportunity to hear the distinctive qualities their playing had in common, particularly their light tone color and smooth rhythmic feel. Though many passages in both solos are mostly tongued, the phrasing doesn't sound uneven; their eighth-notes are not heavily swung, and many of their eighth-note lines are not punctuated by other rhythms. Chord alterations and implied substitute harmonies are indicated in these transcriptions. Gigi does more of these than Art, though the latter does a particularly tasty substitution in the 14th measure of the second A section. Here, Art implies D minor to D♯ diminished, an ascending resolution, while the underlying changes descend from A♭7 to G7. Also notable is the way Gigi begins his second A section with a quote from Charlie Parker's Au Privave; he ends the same section with a reference to George Gershwin's Fascinating Rhythm. Except for a few chord alterations, this second recorded arrangement is quite similar to the one on the original recording (see the first album cover above). On the fourth measure of the head, the E♭ on beat 3 is embellished with a turn, unlike in the first version. The main difference is in the out head clip. Although in this album's liner notes Gigi himself states that in this section "the two horns play a variation of the theme in 3/4 against the 4/4 of the rhythm section," this is in fact a better description of the first version. Here, drummer Art Taylor is simultaneously implying 4/4 and 3/4. The most significant difference here has to do with the measures directly before the return to the head. Unlike in the original, and first, recording, the rhythm section plays a more obvious 3/4 here, so it is best expressed as four measures in 3/4 rather than three measures in 4/4. The melody is now the only element in this section that implies 4/4. As mentioned in the Description for the first recording, the Concert Condensed Score shows melody, harmony and rhythm section information for this arrangement so you can identify the slight variations between the versions. The melody and thus the lead sheets are identical for all versions and reflect the Gigi Gryce Project minus you track format. Gigi's alto sax solo on this recording is also available; click on the Solos tab for more details. As with the first recording of this song (as well as Evening In Casablanca), the rhythm section is unique to this album. However, just one day earlier, Wynton Kelly and Wendell Marshall had both been on a session for a Paul Quinichette/Charlie Rouse album, "The Chase Is On." Wendell Marshall also recorded with Sonny Stitt for "Sonny Stitt With The New Yorkers" on the same day as this Donald Byrd session! Other recordings with Art Farmer, Gigi Gryce and Wynton Kelly together include Benny Golson's "New York Scene," on which Ray Bryant's Something In B-flat was recorded (Gryce didn't play on the Bryant title). As on the Art Farmer recording, Gigi's chorus [clip] is the second solo. It is stylistically similar to his solo from the first version; a few notable points include a reference, in the sixth and seventh measures of the first A section, to the ascending triplet figure from the eighth measure of the head. His first A section ends with a quote of Fascinating Rhythm, as does his second A section on the other recording. The end of the bridge is also similar on the two solos. 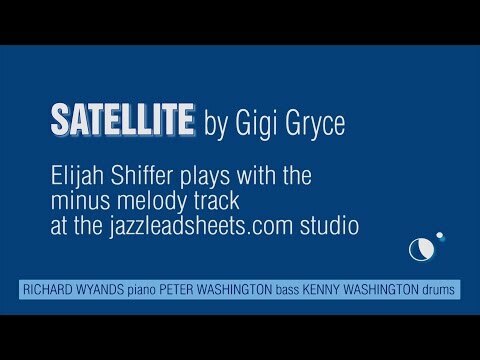 Saxophonist Elijah Shiffer plays with the Minus Melody track of Satellite at the jazzleadsheets.com studio. Our exclusive version of Satellite is based on the Donald Byrd recording, with only a few different chord alterations; this time the horns alternate playing the melody on the intro and the interlude. Check the out chorus (shout) treatment clip. This recording is available as a full quintet track or as Minus You tracks for all instruments. In addition, transcriptions of Bobby Porcelli's and Ralph Moore's solos are available. Click on the Minus You and Solos tabs for more details. For study and comparison, we've provided Concert Condensed Scores for Gigi's own two recorded arrangements (click on each album cover above for details). The melody is the same for all arrangements, so the lead sheet editions shown with each album contain the complete melody in a single part and they're identical; they reflect The Gigi Gryce Project minus you track format. In honor of Gigi's 90th birthday, we're releasing the Gigi Gryce Project. This contains recordings of Gigi's compositions played by a modern all-star quintet, available both as full tracks and in Minus You settings for all instrumentalists to play along with. There are also transcribed solos (alto saxophonist Bobby Porcelli and tenor saxophonist Ralph Moore) from this project. Pianist Richard Wyands played extensively in Gigi's last band in the early '60s; he brings a unique authenticity to these recordings. These sessions were recorded by Rudy Van Gelder at his Englewood Cliffs, NJ, recording studio. Alto saxophonist Bobby Porcelli [clip] and tenor saxophonist Ralph Moore [clip] play one chorus each in the first solo section. (Though the letters of this solo section in the lead sheet are B, C, and D due to the head's different changes, it is an AABC form so we have made this the form in the transcriptions.) These solos are short, accessible, and exciting. They are a good place to become acquainted with Bobby's fluid phrasing and wide-ranging lines, and Ralph's more evenly articulated, rich-toned delivery. More transcriptions of Bobby and Ralph from this project will be available on jazzleadsheets.com soon. Minus You audio: The rhythm section editions are simply explained: minus either piano, bass or drums. All soloists have been eliminated in the minus melody track, so the melody instrument also solos (with just bass and drums) during the piano solo [piano soloist has been removed]. There are four Minus You MP3s, with different combinations of instruments. The following shows a breakdown of each track edition. When you put on your headphones and play with these mixes, you're going to be spoiled for life! We've taken care to balance the mix for each instrument. Unfortunately, most recording in studios today requires listening to the other musicians through headphones. This automatically puts you in an artificial musical environment, very different from your rehearsal for the session, for example. All of us who've done a lot of recording know the trials and tribulations of dealing with headphone mixes in the studio. Drummers and bass players (and pianists) are isolated in booths, but it's essential to hear at least a little of each of them in your mix. However, it'll never be like you'll hear on the final mix of the recording! At Van Gelder's and at a lot of other studios, your headphones are plugged into your own mixer, where you can adjust the volume of each instrument; sometimes you have the ability to pan the instruments from side to side if that is helpful. Experience has taught me to just get something in my phones that's comfortable, not perfect, and then go for it! The final mix is the only time everything will sound right.